LeBron James Lakers have won five of their last six games. 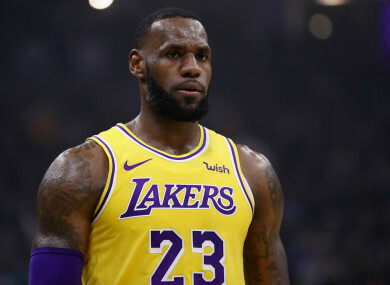 THE MIAMI HEAT had no answers for Los Angeles Lakers star LeBron James in the NBA on Sunday. James scored 51 points and grabbed eight rebounds to lead his team to a 113-97 win over Miami. James also connected on six of his eight three-point attempts in the victory. Los Angeles carried a double-digit lead into half-time and extended their advantage to 16 by the end of the third quarter. From there, they cruised to the win. Kentavious Caldwell-Pope added 19 points off the bench for the Lakers, who have won five of their last six games. Four Heat players reached double-figures in the losing effort. Meanwhile, the Golden State Warriors fell to the Spurs 104-92 in San Antonio. Five Spurs players scored at least 10 points in the win, led by 24 from LaMarcus Aldridge. He also chipped in 18 rebounds. The loss was the Warriors’ third in a row. They have been playing without star guard Stephen Curry, who has been sidelined since November 8 with a groin injury. Draymond Green also missed the game against San Antonio with a toe sprain. Golden State dropped to 12-6 this season after being topped by the Spurs. Email “LeBron scores season-high 51 points in Lakers' win over old side Miami”. Feedback on “LeBron scores season-high 51 points in Lakers' win over old side Miami”.